My amazing team and I are responsible for the Salesforce Student Programs, where we help students learn Salesforce Skills and build there network as they blaze their trail into jobs in the Salesforce ecosystem. We support faculty at leading universities and workforce development programs around the world to teach Salesforce skills in the classroom. 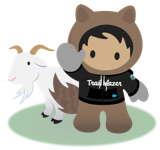 We infuse a student element into everything we do as part of the Trailblazer Community Team. Amanda Bauman hasn't posted any ideas yet.